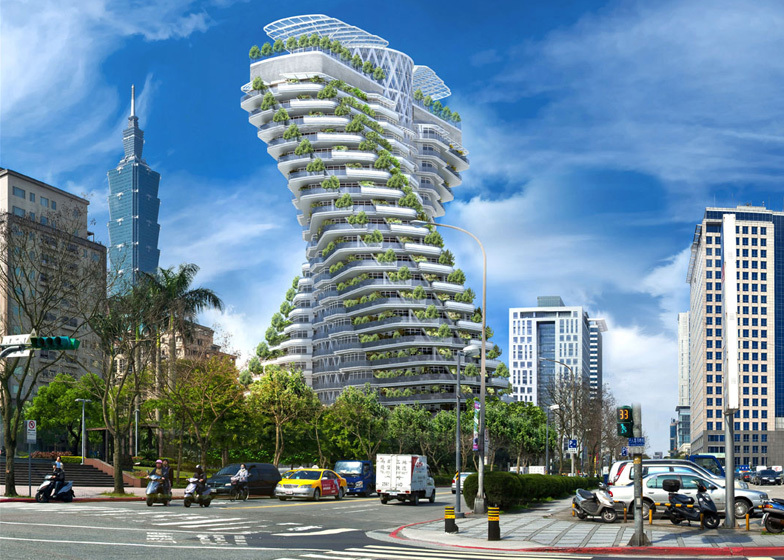 A plant-covered twisting tower shaped like a DNA strand by Belgian architect Vincent Callebaut is under construction in Taipei, Taiwan (+ slideshow). Described by Vincent Callebaut as "neither single tower, nor twin towers", the 20-storey Agora Garden apartment block is designed with a double-helix structure that twists up around a fixed central core. "Different from the modern city built of concrete, glass and steel, the Agora Garden tower appears in an urban centre as a green twisted mountain," says the architect. 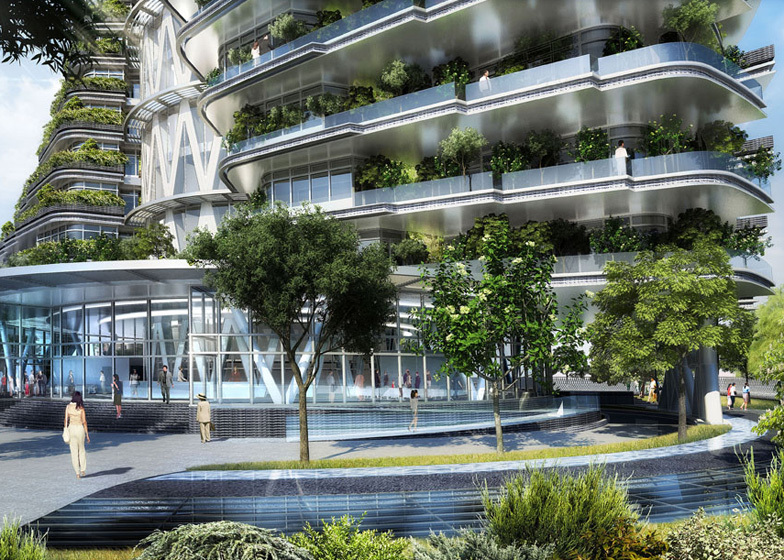 Balconies on each floor will be filled with plants, vegetable gardens and fruit trees, creating a cascading layer of greenery across the exterior. These will enable residents to grow their own food and compost all their biodegradable waste. Between two and four apartments will be located on each floor of the building and will integrate a number of sustainable technologies, including rainwater-harvesting and solar energy. "The concept is to build a true fragment of vertical landscape with low energetic consumption," explains Callebaut. "The project represents a built ecosystem that repatriates the fauna and the flora in the heart of the city and generates a new box of subtropical biodiversity." Agora Garden is being constructed on one of the largest designated residential sites in the city and will be surrounded be a moat. As well as apartments, the building will also accommodate rooftop clubhouses, a swimming pool, gym facilities and car parking floors. The architect also recently unveiled a futuristic concept for "farmscrapers" made from piles of giant glass pebbles. See more architecture concepts by Vincent Callebaut. 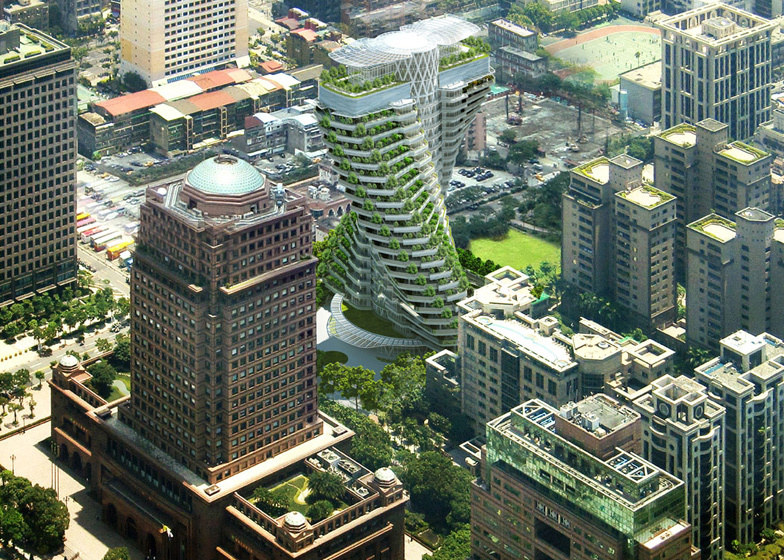 In November 2010, Vincent Callebaut Architectures SARL was awarded as the successful tenderer for the construction of a new luxurious residential tower located at Taipei. The project is currently under construction and will be completed in 2016. In the heart of the urban networks of Xinyin District in full development, the Agora Garden project presents a pioneer concept of sustainable residential eco-construction that aims at limiting the ecologic footprint of its inhabitants by researching the right symbiosis between the human being and nature. On this site that is the last and only biggest parcel of land for residential use, the concept is to build a true fragment of vertical landscape with low energetic consumption. The building is thus eco-designed. It integrates not only the recycling of organic waste and used water but also all the renewable energies and other new state-of-the-art nanotechnologies (BIPV solar photovoltaic, rain water recycling, compost, etc.). The project targets thus the energetic performance so as to be officially approved by the Green Building Label, the norm for high environmental quality, delivered by the Home Affairs Ministry of Taipei. Part of the concept of inhabited and cultivated vertical farm through its own inhabitants, this project of residential tower enables first to design by its avant-gardist architecture a new life style in accordance with the nature and the climate. Actually, the Agora Garden tower superimposes vertically wide planted balconies of true suspended orchards, organic vegetable gardens, aromatic gardens and other medicinal gardens. Such as a living organism, the tower becomes metabolic! It overpasses its energy-consuming passive role (absorbing all the natural resources and rejecting only waste) to produce its own organic food. The architectural concept is thus to eco-design an energy self-sufficient building, whose energy is electric, thermal and also alimentary. 1. The reduction of the climatic global warming. 2. The protection of the nature and the biodiversity. 3. The protection of the environment and the quality of life. 4. The management of the natural resources and waste. Finally, according to the Cradle to Cradle concept where nothing is lost, everything transforms itself; all the construction and furnishing materials will be selected through recycled and/or recyclable labels. By imitating the processes of natural ecosystems, it deals thus with reinventing in Taiwan the industrial and architectural processes in order to produce clean solutions and to create industrial cycle where everything is reused, either back to the ground as non-toxic organic nutrients, or back to the industry as technical nutrients able to be indefinitely recycled. Biotechnological prototype, the Agora Garden project reveals thus the symbiosis of human actions and their positive impact on the nature. Neither single tower, nor twin towers, the project arises towards the sky with two helicoidal towers gathering themselves around a central core. This architectural party offers a hyper-compacted core and a maximal flexibility of the housing storeys (with the possibility to unify two apartments units in one without any footbridge). It brings a reduction of view angles towards the urban landscape and a hyper-abundance of suspended gardens. The Agora Garden tower is, as its name indicates it, directly inspired of the structure in double helix of the DNA (Deoxyribonucleic acid), source of life, dynamism and twinning. Every double helix is represented in the project by two housing units forming a full level. Thus, from its base to the top, the 20 inhabited levels in double helix stretch themselves and twist themselves at 90 degrees. By metaphor, the obtained sinuosity corresponds to the universal musical symbol of harmonic revealing the notion of ultimate balance praised by the project. 1. The first objective is to be perfectly integrated in the north/south pyramidal profile of the building volume. Actually, the morphology of the project changes according to its orientation. Its east/west elevations draw a rhomboidal pyramid whereas the north-south ones represent a reverse pyramid. 2. The second objective is to generate a maximum of cascades of suspended open-air gardens, not part of the F.A.R. (floor area ratio). Thus, the planted balcony surface area can easily exceed the limit of the required 10 percents. The global framework of 40 percents of building coverage ratio, i.e. 3 264 M2 is thus totally respected. 3. The third objective is to offer to the inhabitants exceptional panoramic views on the skyline of Taipei by multiplying the transversal views, especially towards the very close Taipei 101 tower and the Central Business District in full emergence. 4. The fourth objective is to generate from a flexible standardized level a progressive geometry with corbels which assures the intimacy and the confidentiality of each apartment by avoiding the indiscreet vision axes. Inspired from nature, the Agora Garden project is shaped with an organic fluid and dynamic geometry. From the simple and standardized element of the double helix of housing superimposed vertically and put in successive rotation of 4.5 degrees level by level, a multi-facial morphology appears all in convex and concave curves. Actually, according to the point of view of the pedestrian from the surrounding streets, the Agora Garden tower changes of faces and proposes new profiles. Besides this moving geometry wearing a planted dress with sensual style, the project represents a built ecosystem that repatriates the fauna and the flora in the heart of the city and generates a new box of subtropical biodiversity. It is a new nest in the city! In order to ensure the confidentiality of the residents, the whole perimeter of the site is bordered by a mineral moat that animates the outside public space with organic urban furnitures. Inside the parcel, the walls of this moat transform themselves into planted surrounding walls. The main access of the site is located at the Song Yong Road which is less busy that the main avenue, Song Gao Road. The tower is coiled up in the centre of a heavy and luxuriant safe forest of mature trees that protects the intimacy of the inhabitants from the surrounding urban pollution. In the heart of the vegetable lung, the pedestrian square of exotic wood opens itself on a mineral and aquatic glade. Such as the shock wave created by a water drop, the landscape design is made in circles arches and radiates from the epicentre of the tower. A circular light well, curved this time, makes the light, the abundant plants in cascades to the deepest basement. The car parks, the swimming pool and the fitness are thus naturally lightened and ventilated. The ground floor in double height sets through its great transparent facades a high connectivity between the interior community spaces and the exterior garden. The central core has been designed to separate totally the vertical circulations into two housing units on the same level. This core is fixed (it does not pivot). But in order to ensure the rotation of the storeys floor by floor, it is surrounded by a (naturally lightened) horizontal circulation loop welcoming the entry foyer dedicated to each unit. This buffer loop enables thus to set the main entrance always in the axis of each apartment and this despite of the 4.5 degrees rotation storey by storey. 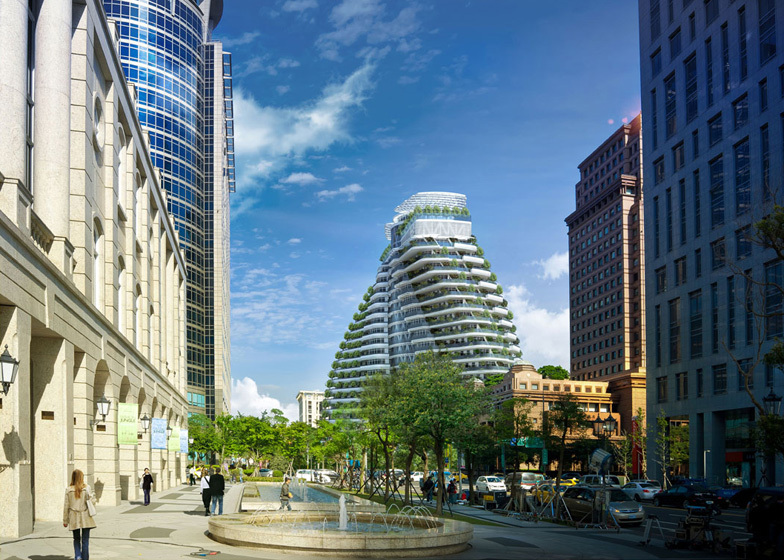 An alternative has been studied to build sky entry foyers directly around the cylindrical central core offering thus planted entry foyers with spectacular front view on the city of Taipei. By level, the central core gathers 2 staircases, 4 high speed elevators of 24 people (1800 kg), 1 car elevators (also useful to carry enormous art pieces, luxury antique vehicles, or even huge pianos, etc. ), 2 sky garages in glass and also all the vertical shafts for the main flows. All these vertical flows are covered by a huge bearing exoskeleton in reinforced steel. The apartments of 540 M2 on average superimpose themselves under the shape of two planted twists unified around a central core. Each unit presents a storey structurally made with Vierendeel beams system behind glass facades only on even floors. All levels are linked at both ends by two spiralling mega columns covered by green walls. Each apartment is completely free columns! This structural concept inspired by the DNA chain enables a maximal flexibility in terms of interior layout. It ensures also an optimal visual permeability (indoor outdoor connectivity) towards the suspended gardens of the balconies in foreground and the urban panorama on the background. Typology A: 2 units with curved living rooms around a central core. Typology B: 2 units with living rooms stretched in the length behind the Southern façades. Typology C: 2 units with living rooms set in bow by the panoramic storey. Typology D: 4 units in duplex with living rooms benefiting from a double height. In addition to these basic typologies, two huge clubhouses are set up on the roof floors so as to respect the setback required by the building volume. Therefore, from the same standardized double helix (1.250 M2 floor area), the rotation of the storey and its customizable interior laying-out makes every level be a unique floor for each resident! Spatially hyper-flexible, the constructive system proposed also a total flexibility to the level of technical distribution of the flows. Additional vertical flows are organized with "oblique shafts" along the glass façade. The system of double deck is integrated at each level under the shape of a double floor and a suspended ceiling. The network of the flows (rain water, used water, hot water, electricity, under floor-heating, cool air, hot air, optic fibre, etc.) crossing the central core can thus irrigate without any difficulty on the horizontal way all the surface area of each storey. Moreover, the use of castellated beams will enable to take advantage of a maximal free height under ceiling. The interior partitioning of each apartment will be à la carte according to the wishes of each inhabitant. The double walls will compartmentalize the different rooms following the curved axes of the building by integrating also many useful storage spaces. The Agora Garden tower is covered by linear crystalline façades repeating themselves at each level. The identical facades in every apartment will be pre-manufactured in factory to accelerate their setting-up during the works. A multilayer glass (airspace + Polyvinyl Butyral) or double layer façades with integrated blinds will be directly associated there in order to protect the interior spaces from the solar radiation in summer and to limit the calorific loss in winter. 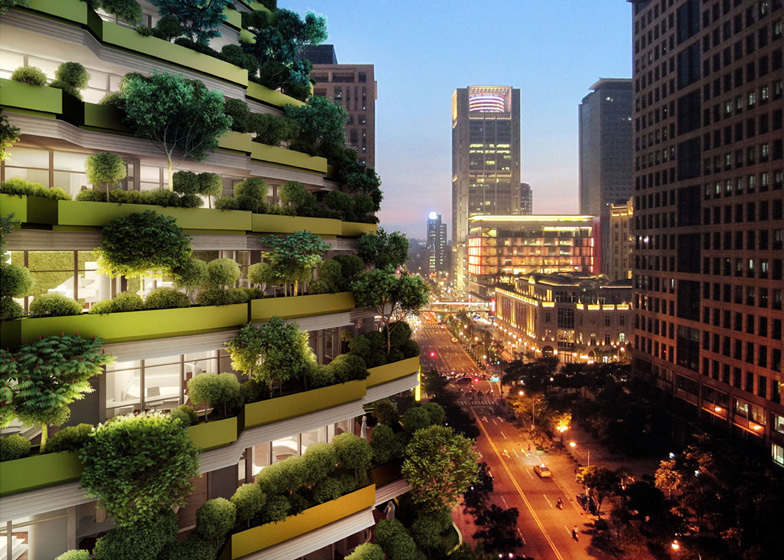 The landscape concept is to build a cascade of suspended gardens which cover the entire building. The tower becomes then a true vertical inhabited park, in a box of nature in the heart of the city! The selected essences will be preferably eatable in order to make each inhabitant gardener in its own vegetable consumption. Suspended orchards, organic vegetable gardens, aromatic and medicinal gardens will flourish the wide and deep jardinière along the global periphery of each apartment. Garden furniture, compost spaces from waste to organic fertilizers, fuel cells, rain water tanks for the irrigation of plants, and ecologic nests for birds will be directly integrated in the design of these jardinières. In order to protect the organic substrate tanks from the heating coming from the solar radiation, the planting beds will be covered by a layer of Bethel white granite on honeycomb. The white colour of the Agora Garden tower will provide a new emblematic, pure and fresh identity. 1. The balconies called ascending or positive:open-air, they benefit from a maximal sunshine and enable to cultivate their trees and shrubs of subtropical essences. We will preferably set up the living rooms on this side. It will be also possible to inlay photovoltaic sunshades at the extremity of the slab according to the wishes of each resident. Thermal captors could be also set up in order to produce sanitary hot water. 2. The balconies called descending or negative:Covered by the superior level, they offer half shadowed relaxing spaces to cultivate flowers, vegetables, aromatic plants and falling and climbing species. We will preferably set up the bedrooms on this side. In bow of the housing storeys, are laid-out some outdoor garden bath sanctuary that coils themselves up in an alcove dig in the façade of each apartment. Different from the modern city built of concrete, glass and steel, the Agora Garden tower appears in an urban centre as a green twisted mountain. Following the seasons, the planted essences (with persistent and deciduous leaves) will make its colours and its abundance to evolve. Declining a camaieu of green in the summer, the tower will blaze with golden and bloody colours in autumn. In spring, it will be bloomed with thousands colours and will liberate floral fragrances from its fruit trees. The tower will then develop perfumed micro-climate for the very best welfare of its inhabitants! Located at 100 meters high, a huge photovoltaic pergola of 1000 m² transforms the sun rays into electric energy which is directly reintroduced into the network of the building. Under this layer with blue-steel reflection, clubhouses are located on the roof surrounded by panoramic sky gardens. They filter and purify the rain water with the action of the plants in order to reinject the water by gravity in the distribution network of sanitary water. From this terrace, there is an extraordinary panoramic view on the 101 tower. Contrary to the traditional car park of 2.10 M high under beams and plunged under an artificial shadowy light, the car park of the Agora Garden project benefits from the natural light. Actually, a light well integrating seismic joints makes the light and the fresh air fall to the levels of the basement. Thus, the car park and the connected facilities (swimming pools and fitness) are naturally ventilated. The main access of the basement is done by the Song Yong Road under a sculptural entry gate inspired by a spiralling leaf. From the level B1, we can access to both car elevators inside the central core and go very quickly to the sky garages located at the entrance of each apartment. The car park is designed in the existing perimeter of the current car park of the pre-existing Agora Garden hotel in order to limit the works cost of excavation and foundations. Only the south-west wall has been corrected so as to set up a laying-out with double helix. Actually, in the continuation of the rotating tower, the car park is drawn according to a circular plan with an ascending interior helix around the core in the direction of the exit and a second descending helix in the direction of the entrance. The whole set forms a continuous banister that welcomes more than 230 cars and 500 scooters. From slab to slab, the minimal height is 3,10 meters which improves comfortably the atmosphere of the building of an immaculate white. It is important to notice that the structure of the tower weights through this car park in order to facilitate the descent of the loading of the whole building. The Challenge Of A Positively Ecologic Revolution! As humbly wrote the influent sinologist, specialist in old China Marcel Granet in the Chinese Thought in 1934: None opposes the human being from the nature; do not think of opposing them such as the free element from the determined element. The Chinese people only see in the Time and the Space a gathering of occasions and sites. These are interdependences, solidarities that constitute the order of the Universe. We do not think that the Man could form a reign in the Nature or that the spirit distinguishes itself from the material. In the heart of Taipei, after having built the city on the landscape, after having then built the city on the city, it is now time for the landscape to rebuild itself on the city! In this perspective of ecologic resilience, the Agora Garden project must be considered as an abstraction of geography and a distortion of ecosystem. The Agora Garden project is a nature built from the living that fights for the re-naturalisation of Ecopolis of tomorrow! This tower reveals strongly and surely the challenge of reinventing a new lifestyle for residential tower, that is self-sufficient, sculpturally unprecedented. It is a project absolutely unique in the world and charismatic drawing with poetry in the oriental sky, a delicate superposition of sky villas with wide suspended private gardens. Last but not least, it is a unique ecologic landmark, new symbol of sustainability at the bottom of the prestigious 101 tower!